We all know how it happens… you are right in the middle of an arts & crafts project and you run out of glue. It can be so frustrating, but did you know that you probably have all of the things around your house that you need to make your own glue? Here’s how to do it. What you need: Glass jar (e.g., an empty pickle jar), metal pot (for the stove), water, nonfat milk, thermometer (a cooking thermometer will work well), white vinegar, a funnel, baking soda, a spoon, and an eye-dropper. What to do: Fill the metal pot half-way full of water and bring to a boil. When the water boils, remove from heat. Fill your glass jar almost 2/3 full with milk, and then fill the rest of the way (~1/3) with white vinegar. 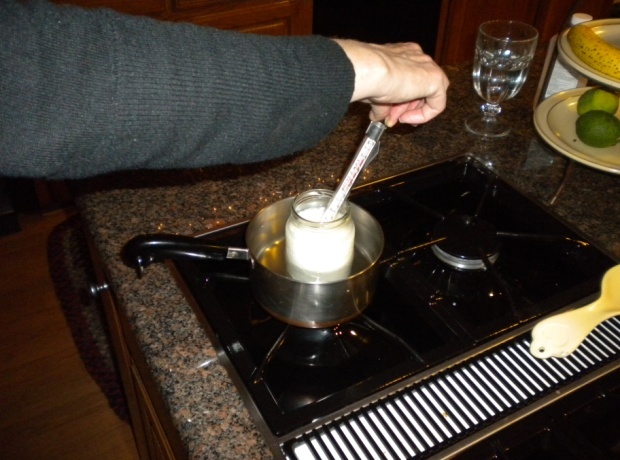 Place the glass jar into the hot water bath and insert the cooking thermometer into the mixture of milk and vinegar. Stir gently with the spoon, until the mixture reaches 60 degrees Celsius (140 degree Fahrenheit). Once the mixture reaches 60 degrees C, use the funnel to filter off any liquid (the whey). The whey can be discarded. Retain the curds andtransfer back into your glass jar. 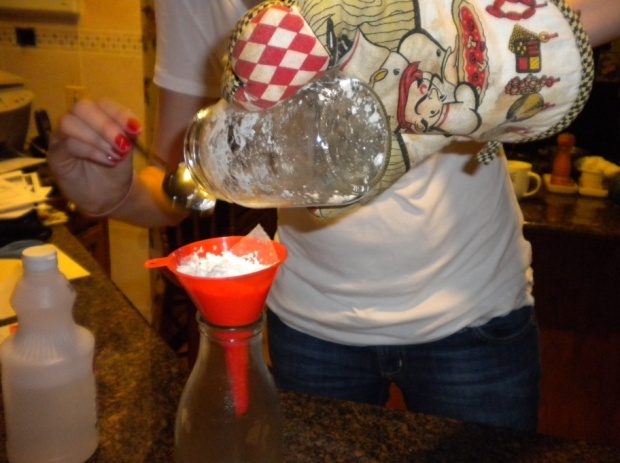 Putting a paper towel in the funnel can help you separate the curds and whey more effectively. Next, stir in 1/2 teaspoon of baking soda (sodium bicarbonate) to the curds. 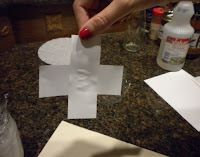 Slowly add drops of water and stir until the mixture retains the consistency of standard white glue. Once you have reached that point, your glue is ready to use! How does it work? Milk contains fat, protein, and lactose, with a normal pH between 6.3 and 6.6. At this pH, the protein in milk remains dispersed. However, when the pH is lowered by the addition of an acid (vineagar = 5% acetic acid), the net charge of the proteins change and they begin to clump or aggregate. The proteins clump together into casein, an insoluble mass, which precipitates out of solution. This the curd that you separated from the whey. The excess acid in the filtered curds is then netrualized by the addition of a base (baking soda = sodium bicarbonate = NaHCO3). After that, you have casein glue! Now, get back to those arts & crafts…plenty of glue to go around. Thanks to Rebecca Denney at U.T. Arlington for submitting this project to DISCUS. Very cool one!